★APEXEL PROFESSIONAL LENSES★ designed specially for Mobile Phones, our lenses are made of premium HD optical glass and aluminum frames. The Universal Clip it is compatible with most Smartphone cameras, such as iPhones 6/7/8/X, iPads, Tablets, etc. 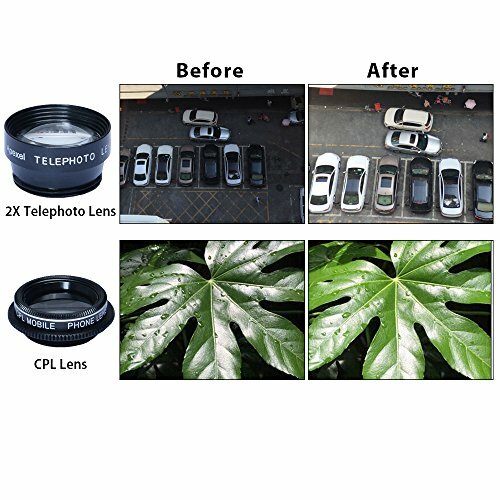 You no longer need to worry about unwanted objects in your photos because our professional HD optical camera lenses help to reduce flare and ghosting while enhancing color and sharpness. This makes them great for photos and videos. 198 degree Fish Eye Lens Works like an ultra-wide angle lens. With it, your phone lens will capture rounded images instead of square ones. 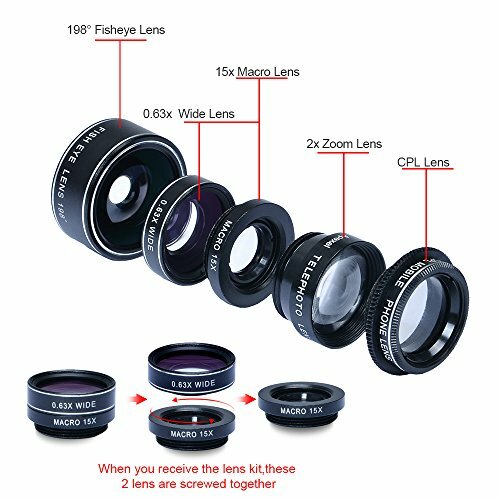 2 in1 15x Macro Lens and 0.63x Wide Angle Lens Two lenses combined for easy storage and transport. The wide angle lens will allow you to capture larger scenes, for example cityscapes, large group shots and more. The macro will enable you to get super close to objects, to pick up all those small details you usually miss. Circular polarized lens (CPL) filters polarized light, reducing reflections, enhancing colors and increasing contrast. The adjustable filter allows for easy control of the effect of polarization. 2x telephoto lens gets up close with 2x optical magnification. Universal Clip-On Lens Holder Screw the lens of your choice into the clip and simply place it over your device’s camera. 16 LED Fill-in Light will be able to provide enough lighting for you to take great selfies, providing continuous LED light, less heat and with a bright light in low light scene. Compatible with: Smart Phones, Tablets including: iPhone 7, SE, 6S/ 6, 6 plus/6S plus, 5, 5S, 5C, 4; Samsung Galaxy S8/S8 Plus, S7/S7 edge, S6/ S6 edge, S5, S4, Note 5 4 3, LG G6; iPad 2, 3, 4, Air; and many more. WITH LENS HOOD : Lens hood remove lens flare to enhance contrast, avoiding lens refraction, restraining image ghost phenomenon, preventing light from hitting the front lens from the sides. CHRISTMAS DAY’s HOT, 4 GREAT LENSES IN 1 KIT: Apexel High Quality Universal Clip-on Removable Camera Lens, great for mobile photography on back or front facing cameras.Includes 4 lenses: 12x Optical Zoom Telephoto Lens, 198° Fisheye Lens, 15X Macro Lens, 0.63X Wide Angle Lens, Phone Holder and Tripod, 1 Year Guarantee, 24 Hours Best Customer Service. Combine with your favorite APPs to share photos instantly. DURABLE & OPTIMUM PERFORMANCE: Crafted using upgraded high-class glass and superior quality aluminum.12x Zoom Lens delivers superior quality pictures from a distance without you having to get too close to your subject. Fisheye can give your images a round, fish bowl effect. Macro can capture amazing close-ups in crisp detail. Wide Angle allows you to capture larger scenes. 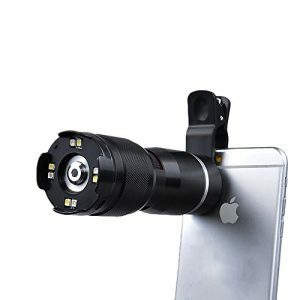 USED AS TELEPHOTO MONOCULAR LENS: This removable clip-on camera lens can also be used as a standalone telescopic lens with a focusing distance of about 3M to help you view distant objects, sceneries, games of F1, football, basketball, or concerts more clearly. 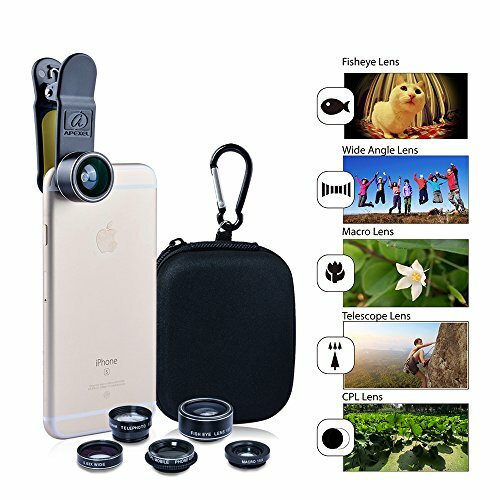 Multi-function of Lens:Cell Phone Camera Lens Kit Wide Angle Lens & Macro Lens+Fisheye Lens+Telephoto Lens+CPL/Flow/Radial/Star Filter+Kaleidoscope 3/6 Lens for iPhone Samsung Sony and Most of Smartphone, create beautiful color,allow and more. High Quality Material: Made of first-class optical glass, aluminum and ABS. manual focusing. The beautiful photo comes from the good quality components.Tripod base is made of non-slip materials for high stability, and has the retractable tripod leg that can adjust the optimal level. 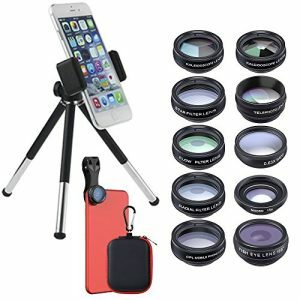 4 Great Lenses Accessories in One Kit: Awesome mobile photography for iPhone Samsung HTC LG Google Huawei Xiaomi. 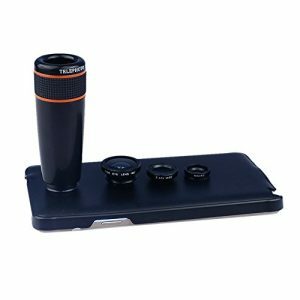 Includes 4 lenses: 10x fixed telephoto lens with manual focus ring, fisheye lens, macro lens and wide angle lens.Combine with your favorite apps to share photos instantly! Enhanced Photography + Video: 10x telescope lens delivers superior quality pictures from a distance without you having to get too close to your subject. Fisheye can give your images a round, fish bowl effect. Macro can capture amazing close-ups in crisp detail. Wide Angle allows you to capture larger scenes. For example, long cityscapes and large group shots. 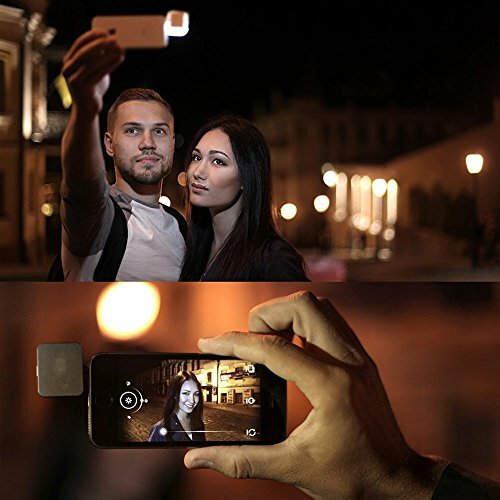 Bluetooth Camera Shutter Remote: Perfect for taking selfies or group shots (including the photographer) from a distance of up to 30 feet (10 m). You only need to pair the remote control with your smartphone once. Then choose the camera app you want to use and press the button of the remote control to capture that awesome picture! 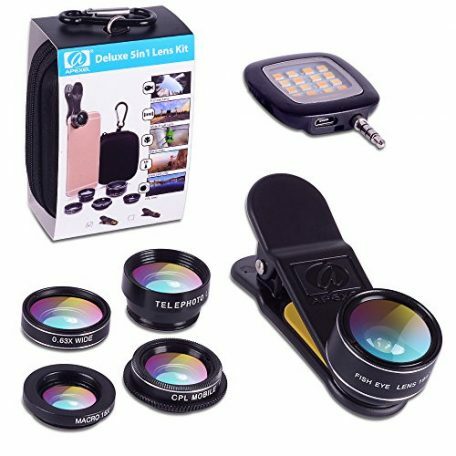 Four Great Lenses in One Kit:12x telephone lens,fish-eye lens,macro and wide angle lens give you arbitrary shooting choice to help you enhance your mobile photography. High -quality Material:The four great lens are made of high-quality aluminum alloy and super-coated optical lens to help you experience high quality mobile photography. 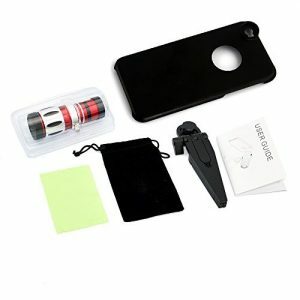 4 Great Lenses Accessories in One Kit: Awesome mobile photography for iPhone Samsung HTC LG Google Huawei Xiaomi. 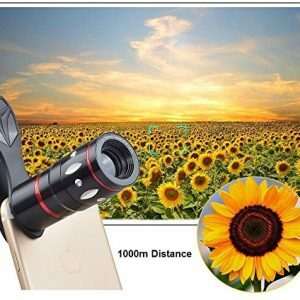 Includes 4 lenses: 8x zoom telephoto lens with manual focus ring, fisheye lens, macro lens and wide angle lens.Combine with your favorite apps to share photos instantly! Enhanced Photography + Video: 8x Telephoto can get a clear shot of subjects usually too far away to capture. Fisheye can give your images a round, fish bowl effect. Macro can capture amazing close-ups in crisp detail. Wide Angle allows you to capture larger scenes. For example, long cityscapes and large group shots. Wide Angle and Macro Lenses in a 2-in 1 Set: These two small lenses are screwed together for easy storage. 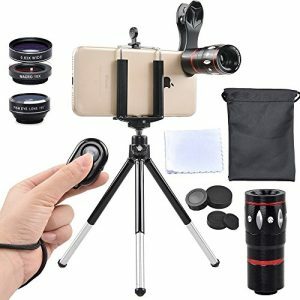 To use the wide angle, simply attach both lenses to the clip provided. 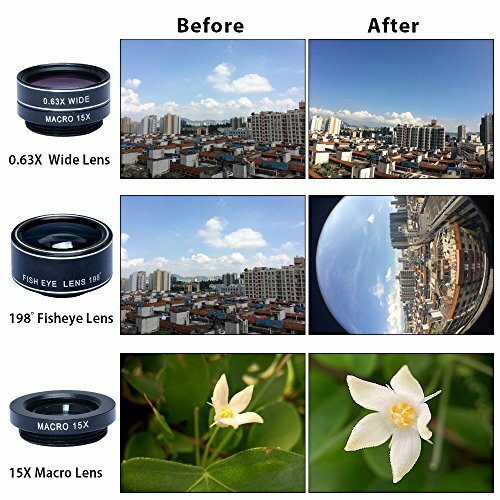 To use the macro lens, simply unscrew the wide angle lens. 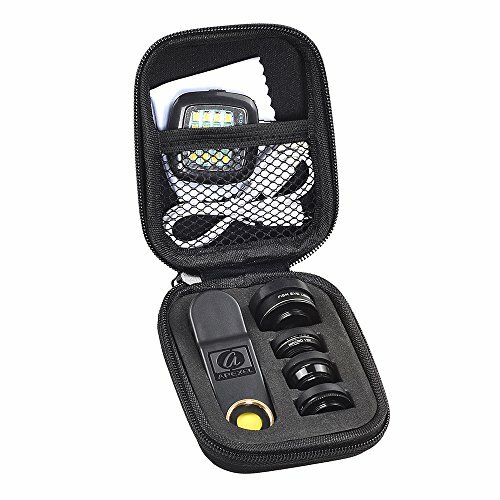 Made of high quality advanced lens to avoid losing light and decreases flare. ABS and aluminium strong structure construction to enhance the durability. 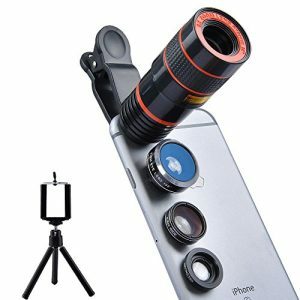 400X microscope magnify lens with universal clip compatible for iPhone6/6S plus SE Samsung Galaxy S7/S7 Edge S6/S6 Edge Note 5/4 and most 98% smart phones. 4x Bright LED light(2x white led and 2x UV led)that provided us a bright view at any dim conditions. 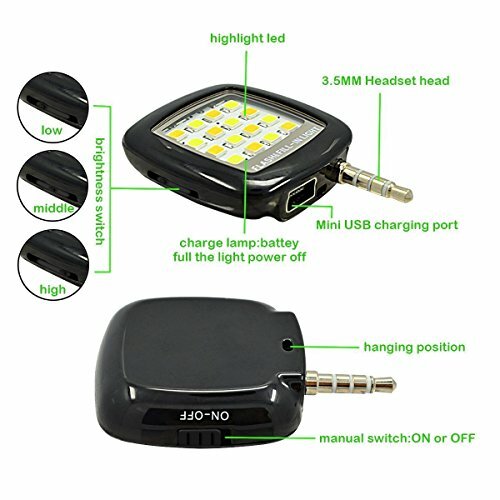 LEDs powered by rechargeable battery(built-in). 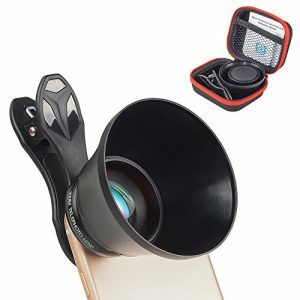 On this Sandra P Photography website we will focus (pun intended) on these items: Smartphone monocular lenses, telephoto lens for Smartphone, Cell phone telephoto lens, Cell phone telescope, Mobile phone telescope, Cell phone zoom lens or even a Mobile camera lens. “SandraPPhotography” is a participant in the Amazon Services LLC Associates Program, an affiliate advertising program designed to provide a means for sites to earn advertising fees by advertising and linking to amazon.com.